When we were in NYC earlier in the month, I grabbed the expired Metro card that my husband was about to throw in the trash can. I had been thinking about the upcoming miniature show and thought it might be fun to paint on the card. Little did I know that there is a fundraiser Single Fare 4 for New York Academy of Art once a year where the Metro card art by artists from all over world is exhibited and sold! I may be late to the party but at least my ideas are not really far out :) I have one more card from that trip to paint on and hoping to get more on my future trips to NYC. I hope I will be able to participate in next year's show ! Almost a month ago, we went to Kitty Hawk to Wright Brother's Memorial National Park to see the Eclipse. It was a memorable experience. It was awe inspiring to check out the sun with the eclipse glasses. I also took along my colander and caught the eclipse through its holes. 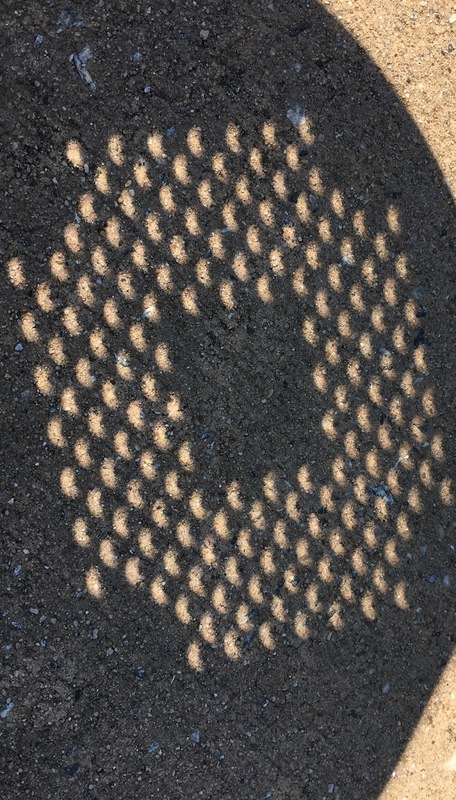 I also made a pin hole camera with a box and poked a lot of different sized holes to look at the eclipse. Where we were it was only 90% eclipse and we did not experience the darkness- only the temperatures dipped and it felt like cool evening ! While I was waiting for the eclipse to start, I sketched and painted the Wright Memorial. I also took some artistic license and moved their building and the markers closer to the Hill just so I could fit them in the paper :) If I had thought about it and really planned it right I could have sketched the memorial a bit more to the left. But adding the other buildings and markers was an afterthought. It took me about an hour to sketch and paint. Wright Brothers National memorial, pen and watercolor 5.5x16.50"